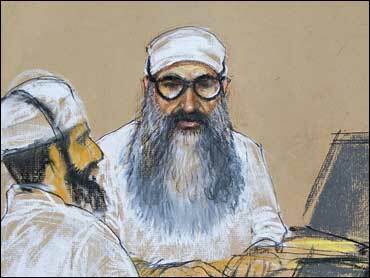 The confessed mastermind of the 9/11 terrorist attacks on America said a courtroom artist at his arraignment Thursday made his nose look too big. No photographers were allowed inside the courtroom for the first appearance of Khalid Sheikh Mohammed and four alleged coconspirators on war crimes charges. So it fell to artist Janet Hamlin to provide the world with the first image of the al Qaeda kingpin since his capture in Pakistan in 2003. Her rendering was reviewed to make sure it didn't include classified information, and wound up in Mohammed's hands when his defense team was given a look, said Pentagon spokesman Navy Cmdr. Jeffrey Gordon. "I heard he said I should compare it to the FBI photo of him," Hamlin said, clutching a copy of the much-publicized capture photo that showed Mohammed in a T-shirt looking disheveled and unshaven. Asked if Mohammed had a point, Hamlin said: "I agree totally" before rushing back to the courtroom to downsize his nose. Hamlin, who worked for The Associated Press before returning freelance work in New York, has made several trips to Guantanamo, and her sketches are being used in a media pool, with joint access. It is not uncommon for courtroom figures to make artistic appeals. Some request more hair; others complain about double chins. New York-based courtroom artist Marilyn Church said that during the first World Trade Center bombing trial, a defense lawyer complained that his client was being portrayed as an angry terrorist. "He looked pretty ferocious to me," Church said. "But I guess the testimony doesn't make you look kindly on them either."